The Eby Ford family has been in the automotive business in Elkhart County, IN since 1922 when Ralph Eby opened a Star & Durant dealership and gas station in Wakarusa, Indiana near Goshen. Other franchise car dealerships that have been in the family include Chrysler, Buick, Chevrolet, and eventually Ford. Ralph Eby purchased the Goshen Ford franchise in Elkhart County in 1952 and Eby Ford also features the Lincoln brand by Ford Motor Company. 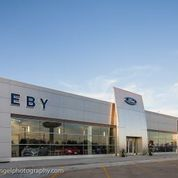 Eby Ford in Elkhart County has won 9 Ford Motor Company Distinguished Achievement Awards, three Ford Motor Company Chairman?s Awards, the North American Customer Excellence Award, and Eby Ford has been featured in Dealer World Magazine. Eby Ford Lincoln is located on US 33 West in Goshen near the intersection of the new CR 17. Conveniently located with Sales, Service, Parts and Collision Center in one location.